Savills have announced the sale of the State Street building on Dublin’s Docklands for €108 million. 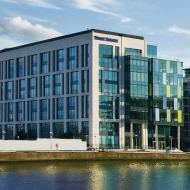 The eight-storey headquarters and adjacent three acre site at 78 Sir John Rogerson’s Quay in south Dublin were brought to the market through Savills in September by Paul McCann and Patrick Dillon of Grant Thornton. The asset is considered to be the highest specified office building in the Dublin Docklands district due, in part, to the occupiers’ exacting requirements and input into the design, specification and fit out when they agreed to take a pre-let of the scheme. The property is currently generating a rental income of €7,818,715 per annum, equivalent to approximately €452 per sq m (€42 per sq ft). The office building at 78 SJRQ is let in its entirety to State Street International (Ireland) Limited with a guarantee from State Street Corporation on a 25-year lease from August 2009, subject to a break option after 10 years. The property extends over a double basement, ground and seven upper floors and comprises 16,226 sq m of high specification office accommodation with 140 basement car parking spaces. The area is home to many internationally recognised corporate occupiers such as Facebook, Google, HSBC, O2, Bank of New York Mellon and Accenture. The undeveloped waterfront site adjoining the existing office building extends to approximately 1.24 hectares (3.06 acres). This gateway site is recognised as one of the last remaining prime development opportunities of significance in the South Dublin Docklands. The site can accommodate approximately 33,300 sq m of office accommodation, 1,040 sq m of commercial space and 80 apartments subject to planning consent. LOST: Buy property on the island!